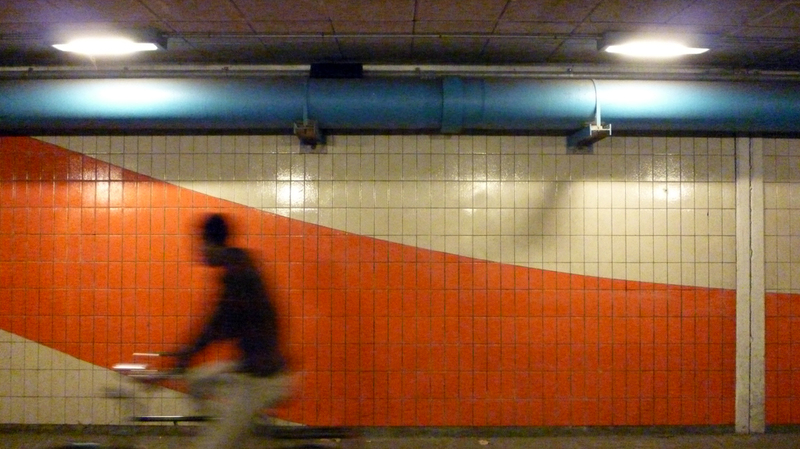 A shifting aural topography based on the daily rhythms and the resonant architecture of a pedestrian and cyclist tunnel. The sound changes over a twenty-four hours cycle, interacting with the existing soundscape and movements of passersby. Exploring the threshold of perception, the work aims to induce a switch of focus, a momentary lapse in the urban transit experience. Acknowledgments: Justin Bennett, Vincent de Boer, Angel Faraldo, Ed Jansen, Jane Huldman, Silvia Janoskova, Hans Latenstein, Aukelien & Niels Leerentveld, Ronald Scholtens, Jelleke Truijen, Yolanda Uriz, Mascha Vandekuinder, Edwin van der Heide, Lex van den Broek and Anne Wellmer. TRANSIENT LAPSE is running for one week as part of this year´s graduates exhibition of the Royal Academy of Art. Departing from the experiments tried out during the preview exhibition in May, we stripped down to one main approach. The idea of using the structural recordings has been developed further. The content consists now in electronic sound tuned up to the resonant characteristics of the tunnel, extended with additional transformed materials based on ultrasonic activity. 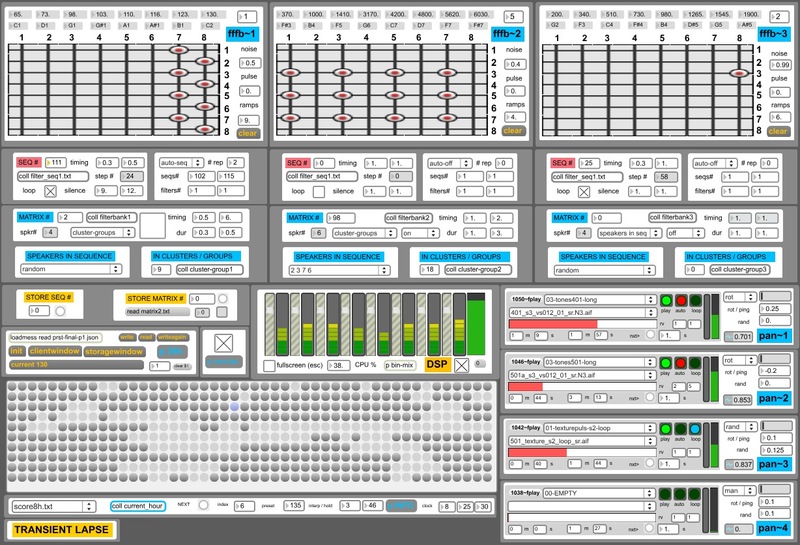 The piece is articulated in real-time using a custom software programmed with Max/MSP. The tool works according to predefined states and algorithmic strategies which keep on changing over time. A continuously shifting aural topography is generated across the tunnel, linking closely the actual sounds produced and how they behave in the space. Inspired by the notion of following the rhythms of the location, we based on them the creation of the sounds and also the overall structure, which runs cyclically over a period the 24h. The result is an organic aural layer which seem to have no physical origin and belong to the site, interacting with the existing soundscape, its fluctuations and with the movement of cyclists and pedestrians. The piece works in the threshold of perception, emerging more intense from time to time, aiming to induce a switch of focus in the passersby, a momentary lapse in the urban experience. Recording session at Jero Papier factory as part of Field Recording Workshop for participants of the Sonology Course and Master students. We used portable stereo and multi-track recorders to make synchronised recordings of the old machines of this amazing factory. Small DPA omni microphones, shotgun and parabolic mics and contact mics of various sorts were used to capture audible and inaudible vibrations and rhythms. The recordings will be used to develop a piece for the Wave Field Synthesis system. Thanks to Sandro for looking after us so well! listen to a stereo recording of a walk around the space here. 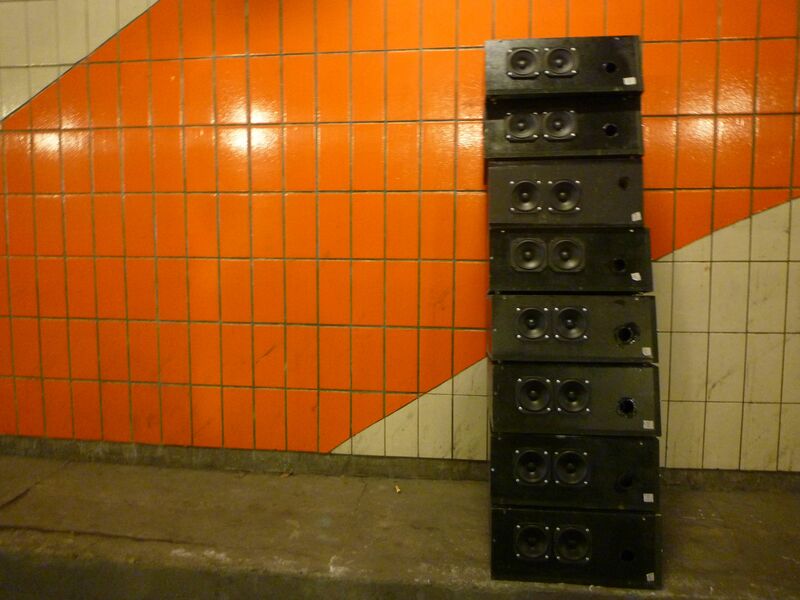 New sounds on the Binckhorst Mapping Project archive. As part of the research in progress for the Transient Lapse Sound Installation, we are interviewing passersby in the tunnel. We ask them about the environmental sounds they perceive, their feelings and thoughts about the acoustic space surrounding this specific location. Our first sessions became a testing ground to grasp the possibilities of the location and learn about combinations of spatialization strategies, contents and approaches that could work out. In order to have more flexibility engaging with the space, we decided to use custom software tools for the project. We designed several sketches which would address the tunnel in different ways. Another initial idea is that the composition should not be totally fixed, but an evolving piece which could for example go through a series of different states during the day. We worked on that direction by programming pseudo random processes which would behave according to our decisions though never exactly occurring in the same way. We tried out basic ideas like filling the space with volumes of continuous sound which the passersby would activate with their own movement, or instead, playing with moving sources across the tunnel. We thought it might be worth trying to incorporate some live input and listen what this could bring. Experiments were made attaching a contact mic to the handrail which goes trough the space, transforming the sound and feeding it back into the space. One of the main approaches used is also creating processes and materials departing from the resonances of the structures present in the tunnel, based on the analysis of previous recordings. The preview exhibition was a chance to elaborate on a selection from all these first experiments and listen to them more carefully. An ongoing cycle of a variable duration of 25-45min in total was composed, with slightly different content on each repetition. In this way, we could listen to the interaction with the activity in the tunnel at different hours and the reactions of the people as well. It is difficult to document this kind of work and we are still thinking about ways of dealing with the fact. Anyway, here there are excerpts from a recording we made on Sunday evening. As an ongoing soundwork in public space, the piece creates different and unpredictable listening situations, particularly in the context of our one weekend exhibition. There are two types of audience, passersby and visitors. For the main and most numerous group, the discovery (or not) of the piece is a key moment and the surprise factor is what we think can make the experience stronger. We can also imagine the perception of many of them would start to evolve if the piece remains installed for a longer period, so they would be able to recognize an explore it over and over in different situations, listening more actively than they usually do. On the other hand, the visitors. They are aware of the work and bring expectations, so depending of what is happening when they arrive, they might end disappointed or actually be the ones who devote more energy to listen, staying for longer periods than any of the passersby. For us it was great to have the installation running for a couple of days in order to appreciate it better and take some distance, being able to listening through the ears of some other people too. With the reactions we collected, we have indeed more material and ideas to work with. Now it is time to continue developing it further and listen forward for the next version of the project, which should be ready in a few weeks. Our general approach is focused around the exploration of the phenomenological, material, spatial qualities of sound. To find out how we could approach this site and work with it, we spent time exploring it through listening, field recording and a series of experiments with a multichannel portable sound system. Attempting to discover what characterizes the soundscape of this place and how does it work, we might roughly approach it through three inseparable elements whose combination shape it. Firstly, the different sound sources and events, then the aural architecture of the space, which modifies all those sounds, and finally, the rhythms which unfold in time. The events which take place are totally defined by the functional nature as a transit space. Therefore, we can mainly hear a variety of sounds produced by the ongoing traffic inside and in the surroundings: trains, bikes, motorbikes, bells, alarms, footsteps, voices, whistling… In terms of aural architecture, this is a quite dry and acoustic space. Having a length of around 90-100m, its interior gets enough isolated from the background noise of the city to stand as an autonomous space, though still remains connected with the outside through the two entrances. These work as two focused windows which expand the acoustic horizon of the passersby. Moreover, the concrete materials and structures play a role too. Metallic ramps and fences are bumped now and then, adding particular resonances and effects. What could be regarded as the most characteristic sound in the tunnel is clearly a product of this combination of aural architecture and events. It is the passing of trains, an occurrence which can not only be heard but also felt physically. There are five railways on top, so trains with different lengths and speeds are passing regularly depending on the hour. This creates the loudest and most immersive moments, with rumbles coming from above resonating across the space. 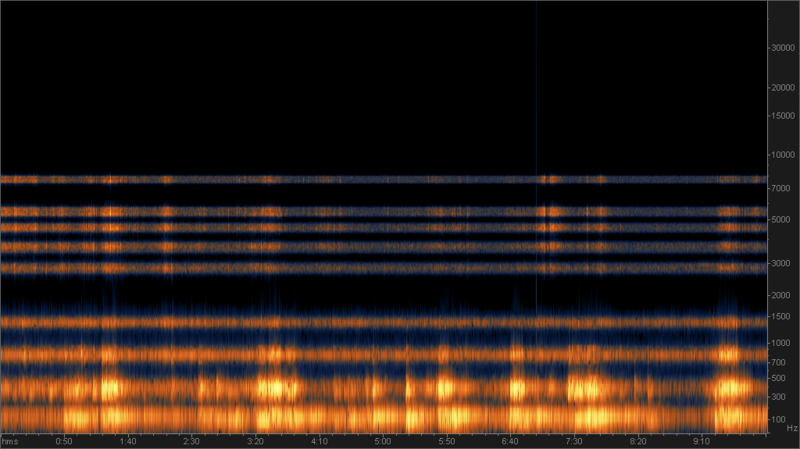 How does this soundscape evolve? Inspired by Henri Lefebvre´s ‘rhytmanalisis’, we can think about rhythms to listen more carefully. It is the repetition, interference and succession of a multiplicity of ongoing processes what animates the space. The linear passing of people and trains back and forth gets combined with the cyclical, longer intervals marked by schedules, by day and night. Even within a shorter time scale, the specific sounds we can hear, many of them from mechanical sources, bring us to this notion of the rhytmical. One of the aspects we usually find more exciting in the work with sound is its ability to extend the thresholds of our perception. One of the possibilities brought by the technologies we use is to amplify and make perceivable what remains unnoticed or simply hidden. This often reveal surprises and potentially establish new connections with spaces and situations too. In this case, we tapped our ears into the structures we found. Then, we can listen to the activity in the space through the very materials it is made of. 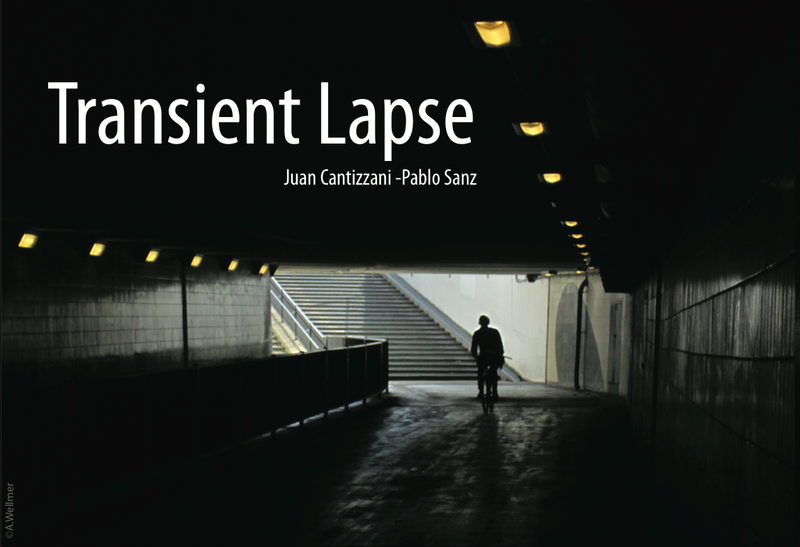 As it was briefly announced here last weekend, Juan and me presented a first version of TRANSIENT LAPSE, a site-specific installation in public space for a location in the Binckhorst area. 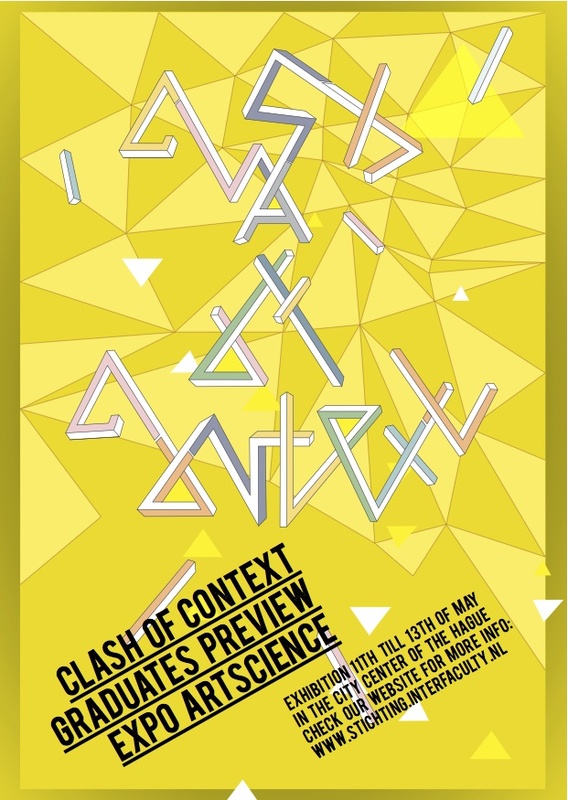 This is our joint graduation project at the ArtScience Interfaculty and it will be shown again at the beginning of July, running for one week as part of the graduates exhibition in the Royal Academy of Art of The Hague. We wanted to use this blog to document our work in progress, though actually so many things have been keeping us busy for weeks that we couldn´t find energy to do this until now. 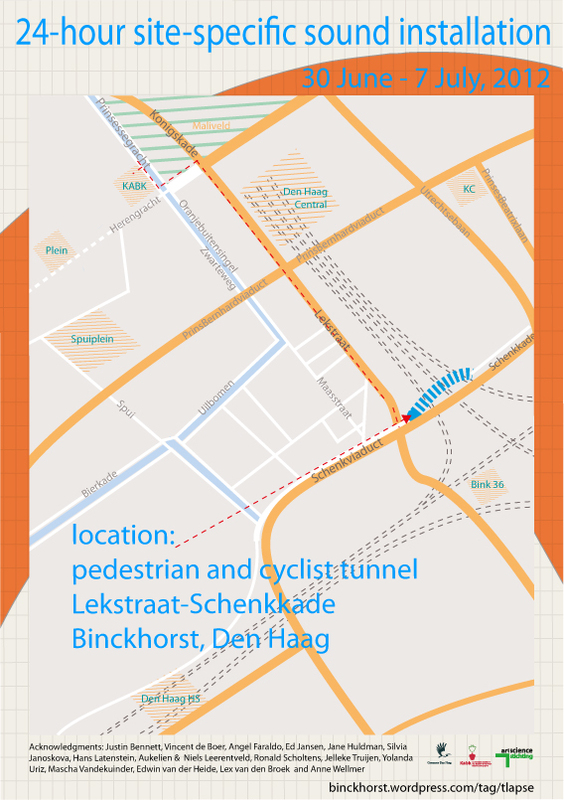 The chosen spot for our project is a tunnel in Schenkkade, used by pedestrians and bicycles to cross under several railways which connect with the nearby Central Station. It runs parallel to Schenkviaduct, used by cars to cross above the railways. The tunnel works aswell as a shortcut to connect Bezuidenhout and the Beatrixkwartier business area with the Binckhorst and the proximities of HS train station. Our initial efforts defining this final project were centered for a while on simply finding a suitable location to develop a site-specific work on which the site itself should be the starting point, becoming the subject more than a container for the work. It has been not an easy task to choose and find all the necessary means and support to accomplish this kind of piece in our school context. Finally, among a bunch of preliminary ideas and experiments on different locations, we found this transit space interesting enough and and decided to create a sound installation for it. The audio is from the very first time Juan and me spent some time together in the tunnel, one evening at the end of February. It is a compression of several moments taken from a 30min recording of the interior focussing in the passing trains above. It was made using two omni microphones separated around 20m from each other, something we tried out to enhance the impression of the ambience and movements inside such a long space. 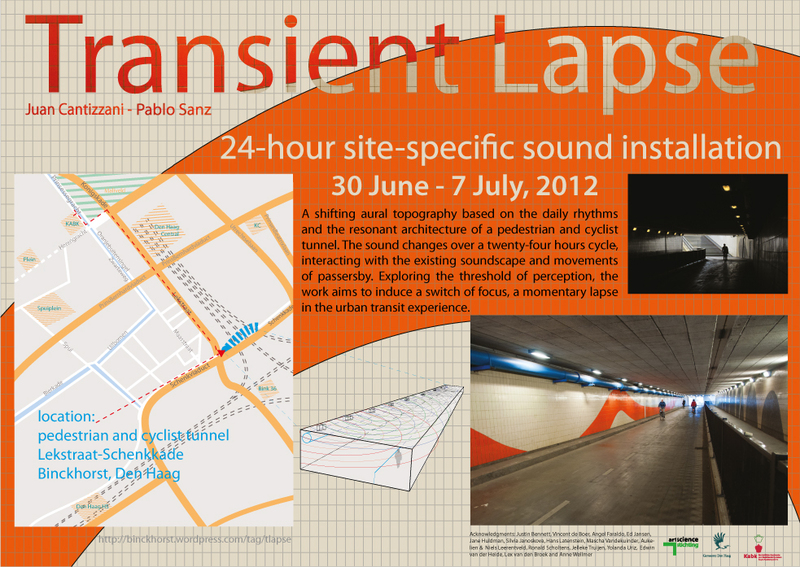 As part of the Interfaculty Artscience graduation projects, Pablo Sanz and Juan Cantizzani are working on a Sound Installation called “Transient Lapse” located at Schenkviaduct (Schenkkade and Lekstraat underground tunnel) and based mainly on sounds collected on location via structural transduction. The installation will be opened at the end of June but now from May 11th untill 13th we are involve in a preview exhibition presenting the first version of the work. As a work in progress, we will report through this blog with several posts.